On October 31, 2018, the FASB issued ASU 2018-17,1 which amends two aspects of the related-party guidance in ASC 810.2 The ASU (1) adds an elective private-company scope exception to the variable interest entity (VIE) guidance for entities under common control and (2) removes a sentence in ASC 810-10-55-37D regarding the evaluation of fees paid to decision makers to conform with the amendments in ASU 2016-173 (issued in October 2016). ASU 2018-17 does not incorporate the changes to the related-party guidance in the VIE primary-beneficiary assessment that were exposed for public comment in the FASB’s June 22, 2017, proposed ASU,4 including amendments to the guidance in ASC 810-10-25-44 (frequently referred to as the “related-party tiebreaker test”). On the basis of feedback received through the comment letter process, the Board decided not to include these changes in the final ASU and added to its research agenda an item to evaluate potential amendments to the related-party guidance in the VIE primary-beneficiary assessment. The determination of whether a legal entity should be consolidated by a reporting entity begins with an evaluation of whether the legal entity is subject to a general exception to the consolidation requirements in ASC 810-10. If a legal entity is not subject to a general exception, the evaluation should focus on whether the legal entity is subject to an exception to the VIE model.5 In March 2014, the FASB issued ASU 2014-07,6 which provided a private-company scope exception to the VIE guidance for certain entities that are under common control and have leasing arrangements that meet certain conditions. If no general scope exception or VIE scope exception is available, when the reporting entity has a variable interest in a legal entity, it is required to determine whether the legal entity is a VIE. If the legal entity is a VIE, the reporting entity should evaluate whether it is the primary beneficiary of the VIE. Under ASC 810, the primary beneficiary of a VIE is defined as the entity that has both (1) the “power to direct the activities of a VIE that most significantly impact the VIE’s economic performance” (the “power criterion”) and (2) the “obligation to absorb losses of the VIE . . . or the right to receive benefits from the VIE that could potentially be significant to the VIE” (the “economics criterion”). 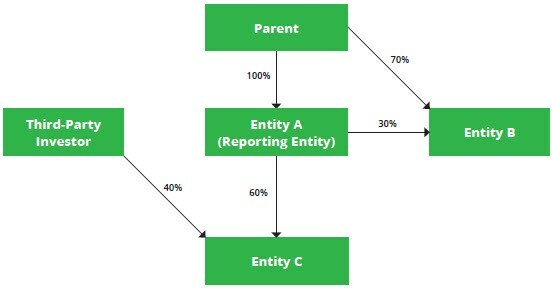 ASU 2015-027 (issued in February 2015) and ASU 2016-17 amended the economics criterion to require a reporting entity that is a single decision maker to consider, when assessing the effects of related-party relationships, interests held by its related parties (including de facto agents) only if the reporting entity has a direct interest in the related parties.8 Under ASC 810, as amended by those two ASUs, interests held through related parties under common control are considered (1) in their entirety as direct interests held by the decision maker in the evaluation of whether the decision maker’s fee arrangement is a variable interest and (2) proportionately as an indirect interest held by the decision maker in the primary-beneficiary analysis. a. The reporting entity and the legal entity are under common control. b. The reporting entity and the legal entity are not under common control of a public business entity. c. The legal entity under common control is not a public business entity. d. The reporting entity does not directly or indirectly have a controlling financial interest in the legal entity when considering the General Subsections of this Topic. The Variable Interest Entities Subsections shall not be applied when making this determination. ASC 810-10-15-17AE (added by the ASU) provides guidance on applying criterion (a) above, which requires a determination that the reporting entity and the legal entity are under common control. Specifically, ASC 810-10-15-17AE provides that solely for the purpose of applying criterion (a), a private-company reporting entity should consider only the voting interest model when making this determination. That is, a private-company reporting entity is not required to consider the VIE guidance when determining whether criterion (a) is met. The example below illustrates the applicability of ASC 810-10-15-17AD. Parent has a 100 percent direct voting interest in Entity A (the reporting entity) and a 70 percent direct voting interest in Entity B. Entity A has a 30 percent direct voting interest in B and a 60 percent direct voting interest in C. Third-Party Investor has a 40 percent direct voting interest in C.
The respective voting interests of Parent, A, and Third-Party Investor are summarized in the diagram below. None of the entities are PBEs; therefore, criteria (b) and (c) are met. There are no contractual arrangements through which a third party controls B or C.
Third-Party Investor does not have substantive participating rights in C.
Parent has a controlling financial interest in A, B, and C through its direct and indirect voting interests. Therefore, A, B, and C are under common control for purposes of applying criterion (a) in ASC 810-10-15-17AD. Entity A can apply the private-company scope exception of ASC 810-10-15-17AD to B because A does not directly or indirectly have a controlling financial interest in B and therefore also meets criterion (d). However, A cannot apply the scope exception to C because A has a controlling financial interest in C and therefore does not meet criterion (d). The Codification does not specifically define common control. However, additional clarification of the FASB’s views on common control is provided in the Background Information and Basis for Conclusions of both ASU 2014-07 and ASU 2015-02. Paragraphs BC19 through BC21 of ASU 2018-17 align with ASU 2014-07 as outlined above, with one key exception. ASU 2018-17 permits a reporting entity to apply the new private-company scope exception only if the reporting entity and legal entity are under common control on the basis of a common-control parent’s voting interest. Paragraph BC21 of ASU 2018-17 highlights the Board’s conclusion that solely for the purpose of applying this scope exception, a private-company reporting entity should consider only the voting interest model when determining whether the reporting entity and legal entity are under common control. Paragraph BC20 of ASU 2018-17 states that the ASU is not intended to change how entities determine whether an arrangement is under common control when applying other guidance in U.S. GAAP. Since ASU 2014-07 did not define common control or limit how to determine whether entities that intend to apply the scope exception in that ASU are under common control, it is possible that a reporting entity applying ASU 2014-07 would not meet the criteria to apply the scope exception in ASU 2018-17. In the illustration below, we would not expect Subsidiary A (the reporting entity) to be eligible to apply the scope exception in ASU 2018-17 because Parent is the primary beneficiary of A through a contractual arrangement and does not hold a voting interest in A. Therefore, A (the reporting entity) and Subsidiary B (the legal entity) are not under common control of Parent solely on the basis of voting interest. Although paragraph BC69 of ASU 2015-02 highlights that a parent and its subsidiary are entities under common control, we do not believe that the private-company scope exception in ASU 2018-17 can be applied to parent-subsidiary common-control relationships when the parent is the reporting entity. To be under common control for the purpose of applying criterion (a) in ASC 810-10-15-17AD, a parent must have a controlling financial interest through its voting interest in both the reporting entity and the legal entity. If the parent is also the reporting entity, criterion (d) in ASC 810-10-15-17AD would not be met because the reporting entity (in this case, the parent) would have a controlling financial interest in the legal entity through its voting interest. Certain nonpublic entities may meet the definition of a PBE because of statutory or regulatory requirements. Such entities would not be eligible to apply the private-company scope exception in ASU 2018-17. As noted above, a reporting entity that wishes to apply the private-company scope exception in ASU 2018-17 is required to determine whether the reporting entity and legal entity are under common control solely on the basis of the voting interest model. Therefore, in structures in which a common-control parent has the majority vote in both the reporting entity and the legal entity and no other investors have substantive participating rights, criterion (a) in ASC 810-10-15-17AD would be met (i.e., the reporting entity and legal entity would be determined to be under common control). In addition, criterion (d) would be met because the common-control parent rather than the reporting entity would have a controlling financial interest in the legal entity. Consequently, the reporting entity would be eligible to apply the scope exception provided that the common-control parent, reporting entity, and legal entity are not PBEs in accordance with criteria (b) and (c) in ASC 810-10-15-17AD. In the illustration below, Subsidiary X (the reporting entity) would be eligible to apply the scope exception with respect to Subsidiary Y (the legal entity) only if the three entities are not PBEs. Subsidiary X would be able to apply the scope exception because Parent Company, the common-control parent, has a controlling financial interest through its majority voting interest in both X and Y.
ASU 2018-17 supersedes the existing accounting alternative under ASC 810 that originated from ASU 2014-07 since the FASB believes that the new guidance on common-control relationships for private companies would encompass existing leasing arrangements that qualified for the previous scope exception. Like the accounting alternative under current guidance, the private-company scope exception provided by ASU 2018-17 would be considered an accounting policy that, if elected, should be applied consistently to all legal entities that qualify for it. As a result of meeting the criteria in ASC 810-10-15-17AD for applying the new scope exception, specifically criterion (d), private-company reporting entities that apply the scope exception and therefore do not consolidate under the VIE model would also not consolidate under the voting interest entity model since those entities would not have qualified for the scope exception if they had a controlling financial interest under the voting interest entity model. Consequently, private-company reporting entities that apply the scope exception will be required to provide enhanced disclosures similar to those required of entities that apply the VIE guidance. See the appendix for a list of the disclosure requirements. ASC 810 currently requires indirect interests held by related parties under common control to be considered in their entirety11 in the evaluation of whether a decision maker’s fee arrangement is a variable interest under ASC 810-10-55-37(c). ASU 2016-17 amended ASC 810-10-25-42 to require consideration of these indirect interests on a proportionate basis in the primary-beneficiary analysis but did not align current guidance with the considerations related to the variable interest analysis. Accordingly, ASU 2018-17 now aligns the guidance by removing a sentence in ASC 810-10-55-37D12 to conform the guidance in that paragraph with the amendments in ASU 2016-17. Under current guidance, there is asymmetry in the manner in which a decision maker’s indirect interests held through a related party under common control are evaluated regarding (1) the identification of a variable interest and (2) the determination of a VIE’s primary beneficiary in the assessment of related-party relationships. Under ASU 2018-17, however, the evaluation of indirect interests would be aligned in both of these analyses. Therefore, it is less likely that a decision maker applying ASU 2018-17 would be required to apply the VIE model because fewer fee arrangements would qualify as variable interests. For example, as the diagram below depicts, a fund’s single decision maker could have only a 5 percent interest in a related party under common control that holds a 20 percent interest in a fund. Under ASC 810 as amended by ASU 2015-02 and ASU 2016-17, the single decision maker would have a variable interest in accordance with ASC 810-10-55-37(c) and ASC 810-10-55-37D because the 20 percent interest held by the entity under common control would be treated as the decision maker’s interest in its entirety. When performing the primary-beneficiary analysis, the decision maker would treat only 1 percent of the interest as its own in determining whether it has satisfied the economics criterion. Accordingly, the decision maker’s fee arrangement would satisfy the power criterion, but the fee arrangement itself would not satisfy the economics criterion. Under ASU 2018-17, the decision maker will consider only the 1 percent interest as its own (i.e., proportionately) when evaluating whether the fee arrangement was a variable interest, in a manner similar to its assessment of the interest attributable to the decision maker in the primary-beneficiary step under current guidance. Thus, the fee arrangement would not be a variable interest provided that the fees are otherwise “commensurate”14 and “at market”15 under ASC 810-10-55-37(a) and (d). The decision maker would therefore not be required to apply the VIE model because it does not have a variable interest. The changes made by ASU 2018-17 do not affect interests held through a subsidiary since such interests should be treated as direct interests of the consolidated group in a consolidation assessment. Consider the example below. GP (Service Provider) owns 20 percent of CLO Fund. The remaining 80 percent is owned by unrelated Third-Party LPs. CLO Fund owns a 30 percent residual interest in CLO Subsidiary. GP (Service Provider) has a management agreement with, and acts as the decision maker for, CLO Subsidiary. Under the agreement, GP (Service Provider) receives fees that are deemed commensurate and at market. Both CLO Fund and CLO Subsidiary have been deemed VIEs because neither of them has substantive participating rights or kick-out rights. Assume that GP (Service Provider) has power over CLO Fund, which, in conjunction with the 20 percent equity interest of GP (Service Provider) in CLO Fund, results in the consolidation of CLO Fund by GP (Service Provider). 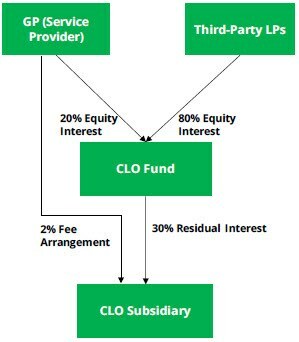 Because GP (Service Provider) consolidates CLO Fund, CLO Fund’s 30 percent residual interest in CLO Subsidiary represents a direct interest of GP (Service Provider) in CLO Subsidiary (i.e., it is not considered an indirect interest that would be assessed on a proportionate basis). Consequently, GP (Service Provider) would be the primary beneficiary of CLO Subsidiary since (1) the GP (Service Provider) management agreement represents a variable interest in CLO Subsidiary and provides GP (Service Provider) with power over CLO Subsidiary and (2) CLO Fund’s 30 percent residual interest in CLO Subsidiary, which represents a 30 percent direct interest in CLO Subsidiary for GP (Service Provider), meets the economics criterion. For entities other than private companies, ASU 2018-17 is effective for fiscal years beginning after December 15, 2019, including interim periods therein. For private companies, the ASU is effective for fiscal years beginning after December 15, 2020, and interim periods within fiscal years beginning after December 15, 2021. Early adoption is permitted. In a manner consistent with the amendments in previously issued ASUs related to ASC 810, the amendments in ASU 2018-17 are required to be applied retrospectively with a cumulative-effect adjustment to retained earnings at the beginning of the earliest period presented. In March 2016, the FASB issued ASU 2016-03,16 which gives private companies a one-time unconditional option to forgo a preferability assessment the first time they elect a private-company accounting alternative within the ASU’s scope. ASU 2016-03 contains no effective date or transition guidance, eliminates the effective dates of private-company accounting alternatives that are within the ASU’s scope, and extends the transition guidance for such alternatives indefinitely. ASU 2016-03 would be burdensome for reporting entities that currently apply the existing accounting alternative under ASC 810 because they would have to apply the new private-company scope exception immediately to maintain their existing accounting presentation and, consequently, apply the exception to all other legal entities that are eligible for it at that time. Accordingly, the December 15, 2020, effective date of ASU 2018-17 for private companies is intended to give those companies sufficient time to decide whether they want to elect using the new private-company scope exception. However, reporting entities that consider making this election after the effective date of ASU 2018-17 will be required to perform a preferability assessment in accordance with ASC 250 if the election represents a change in accounting policy. Under ASC 810, the determination of whether a legal entity is a VIE, and, if so, whether the reporting entity is required to consolidate the legal entity must generally be made upon the reporting entity’s initial involvement with the legal entity. However, ASU 2018-17 allows the reporting entity to make this determination as of the date of application of the ASU if it is not practicable for the reporting entity to obtain the information necessary to make the determination as of the date of initial involvement. ASU 2018-17 requires a cumulative-effect adjustment to retained earnings at the beginning of the earliest period presented. The cumulative-effect adjustment is based on the carrying amounts of the assets, liabilities, and noncontrolling interests of the legal entity (when consolidation is required)17 or the carrying amount of any retained interest in the legal entity (when deconsolidation is required)18 if it is practicable to determine such carrying amount(s). In addition, the ASU provides a practicability exception for determining the carrying amounts of the assets, liabilities, and noncontrolling interests of a consolidated legal entity (or the carrying amount of any retained interest in a deconsolidated legal entity). A reporting entity that elects the practicability exception will be allowed to initially measure such carrying amount(s) at fair value. As previously noted, it is possible that a reporting entity applying the current scope exception in ASC 810 (as provided by ASU 2014-07) would not be eligible to apply the scope exception in ASU 2018-17. In that case, the reporting entity would be required to apply the guidance in the VIE model retrospectively in accordance with ASC 810-10-65-9. If a reporting entity applies the new private-company scope exception upon transition to ASU 2018-17 and one of the entities (the parent, reporting entity, or legal entity) subsequently becomes a PBE, the reporting entity can no longer apply the scope exception. In that case, the transition approach would depend on which entity became a PBE. If the reporting entity is not the entity that became a PBE, prospective application of the VIE guidance would be required. However, if the reporting entity is the entity that became a PBE, retrospective application of the VIE guidance would be required. Therefore, the reporting entity must continually assess whether it can continue to apply the scope exception. ASU 2018-17’s disclosure requirements related to the private-company scope exception are reproduced below. a. The nature and risks associated with a reporting entity’s involvement with the legal entity under common control. b. How a reporting entity’s involvement with the legal entity under common control affects the reporting entity’s financial position, financial performance, and cash flows. c. The carrying amounts and classification of the assets and liabilities in the reporting entity’s statement of financial position resulting from its involvement with the legal entity under common control. d. The reporting entity’s maximum exposure to loss resulting from its involvement with the legal entity under common control. If the reporting entity’s maximum exposure to loss resulting from its involvement with the legal entity under common control cannot be quantified, that fact shall be disclosed. e. If the reporting entity’s maximum exposure to loss (as required by (d)) exceeds the carrying amount of the assets and liabilities as described in (c), qualitative and quantitative information to allow users of financial statements to understand the excess exposure. That information shall include, but is not limited to, the terms of the arrangements, considering both explicit and implicit arrangements, that could require the reporting entity to provide financial support (for example, implicit guarantee to fund losses) to the legal entity under common control, including events or circumstances that could expose the reporting entity to a loss. a. The private company (reporting entity) has an economic incentive to act as a guarantor or to make funds available. b. The private company (reporting entity) has acted as a guarantor for or made funds available to the legal entity in the past. 50-2AI In disclosing information about the legal entity under common control, a private company (reporting entity) shall present these disclosures in addition to the disclosures required by other guidance (for example, in Topics 460 on guarantees, Topic 850 on related party disclosures, and Topic 842 on leases). Those disclosures could be combined in a single note or by including cross-references within the notes to financial statements. 1 FASB Accounting Standards Update (ASU) No. 2018-17, Targeted Improvements to Related Party Guidance for Variable Interest Entities. 3 FASB Accounting Standards Update No. 2016-17, Interests Held Through Related Parties That Are Under Common Control. 4 FASB Proposed Accounting Standards Update, Targeted Improvements to Related Party Guidance for Variable Interest Entities. 5 See additional discussion in Chapter 3 of Deloitte’s A Roadmap to Consolidation — Identifying a Controlling Financial Interest. 6 FASB Accounting Standards Update No. 2014-07, Applying Variable Interest Entities Guidance to Common Control Leasing Arrangements — a consensus of the Private Company Council. 7 FASB Accounting Standards Update No. 2015-02, Amendments to the Consolidation Analysis. 8 See also the guidance in ASC 810-10-25-44 through 25-44B on determining the primary beneficiary for certain related-party relationships. a. An individual or enterprise holds more than 50 percent of the voting ownership interest of each entity. b. Immediate family members hold more than 50 percent of the voting ownership interest of each entity (with no evidence that those family members will vote their shares in any way other than in concert). (1) Immediate family members include a married couple and their children, but not the married couple’s grandchildren. (2) Entities might be owned in varying combinations among living siblings and their children. Those situations would require careful consideration regarding the substance of the ownership and voting relationships. 13 It is assumed that Subsidiary A receives a fee for decision-making that meets the conditions in ASC 810-10-55-37(a) and (d). 14 The fees are compensation for services provided and are commensurate with the level of effort required to provide those services. 15 The service arrangement includes only terms, conditions, or amounts that are customarily present in arrangements for similar services negotiated at arm’s length. 16 FASB Accounting Standards Update No. 2016-03, Intangibles — Goodwill and Other (Topic 350), Business Combinations (Topic 805), Consolidation (Topic 810), Derivatives and Hedging (Topic 815): Effective Date and Transition Guidance — a consensus of the Private Company Council.